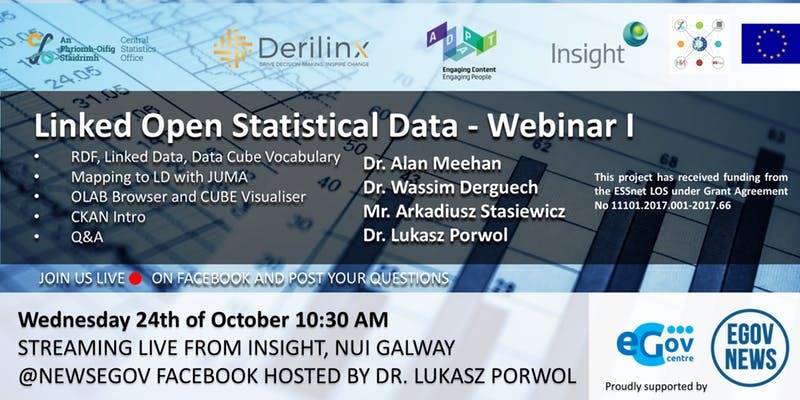 A Linked Open Statistical Data Webinar took place on October 24th 2018 to present a Linked Data Publishing Pipeline developed by Derilinx in collaboration with Insight Centre for Data Analytics (National University of Ireland, Galway) and ADAPT Centre (Trinity College Dublin). The pipeline was developed and tested with four European National Statistics Offices: Central Statistics Office in Ireland, National Institute of Statistics and Economic Studies in France, Istituto Nazionale di Statistica in Italy and National Statistical Institute in Bulgaria. The webinar was targeted towards a wide range of users with little knowledge of Linked Data and aimed to showcase/demo some of the tools that have been developed within this project. The event was streamed live on Facebook and access to the video is possible through this link. The same team is planning a second Webinar for early 2019 ad they move towards the second step of creating linked open statistical data: consuming and using this data for building application for a wider audience.